I've enjoyed getting up at 6:30am the past three mornings and watching the FIBA games featuring the USA team. Team USA put a good whupping on Slovenia and Senegal and handled Italy with ease. Carmelo Anthony's 27 point second half burst pulverized the Italians who led by 12 at the half. Next is Australia who won their group (C). Expect either an USA-Argentina final which should be incredible or USA-Germany. It's amazing watching international play. The USA players, individually, are the still the best, but the need to play as team still tops everything. In the NBA it takes two great players and three or four good players to win a title. But how do you take 12 great players and make them play as a team? This is why it is easy for Argentina, Spain and other countries to field a team with two great players and a few good team/role players. And in a one-off championship all it takes is one hot-hand shooting threes by an opponent and a cold-shooting off night for Team USA to send us home again. Talk about pressure. The Europeans are used to it. Now the Americans are learning it. 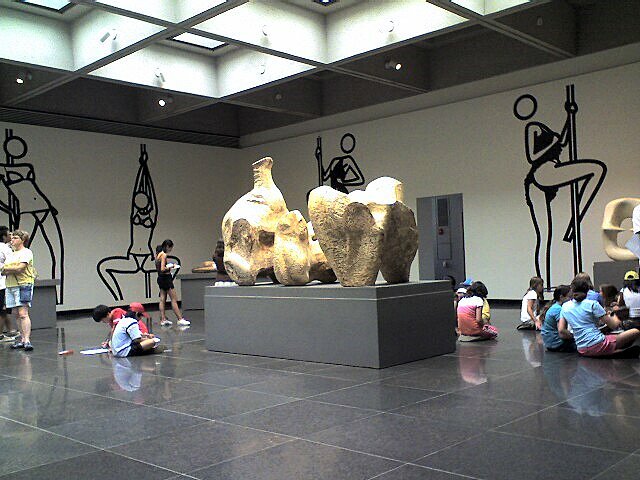 We made an interesting stop at the Art Gallery of Ontario in Toronto this summer. 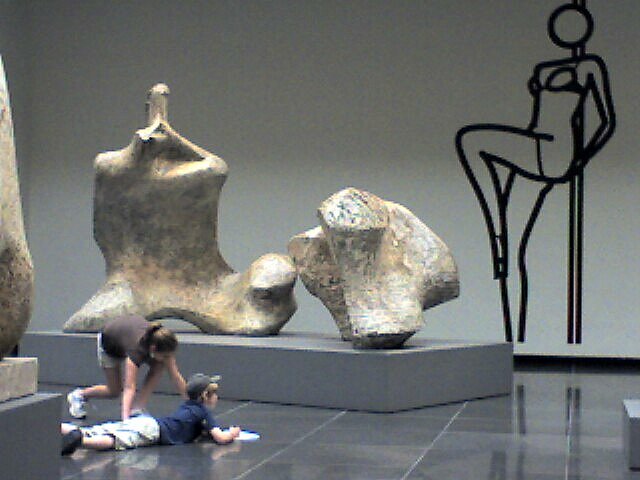 There was an exhibit of exceptional Henry Moore sculptures. 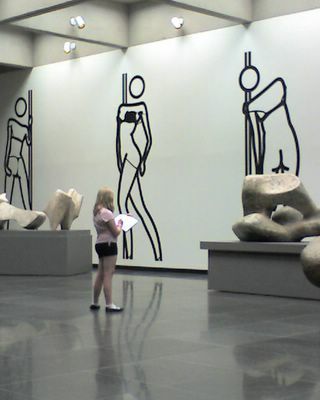 But the walls were covered with several line art drawings of an exotic pole dancer. 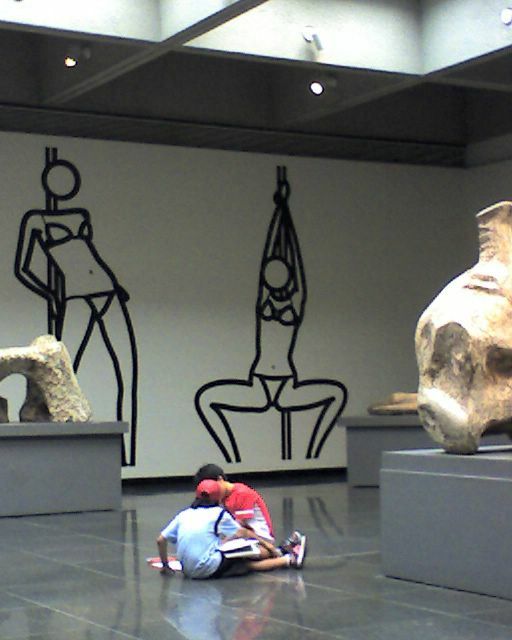 These were called SwingSpace: Wallworks by Julian Opie. Well, gee whiz, the human body sure looks interesting and I am sure that's what many of the young grade student artists thought when they visited the gallery. Here's a wide view of the room. My Treo SmartPhone was at hand to snap these shots. The students spread out to start drawing. Hmmm, this teacher eyes me suspiciously. A group of young ladies has at it. While another goes it alone. 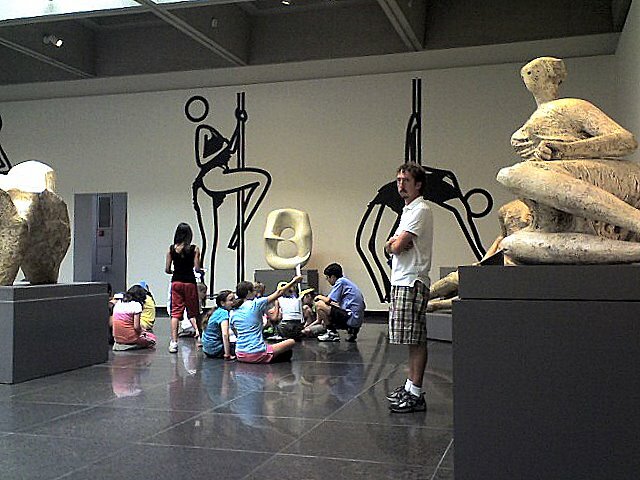 This young man appears to be drawing the pole dancer rather than the sculptures. 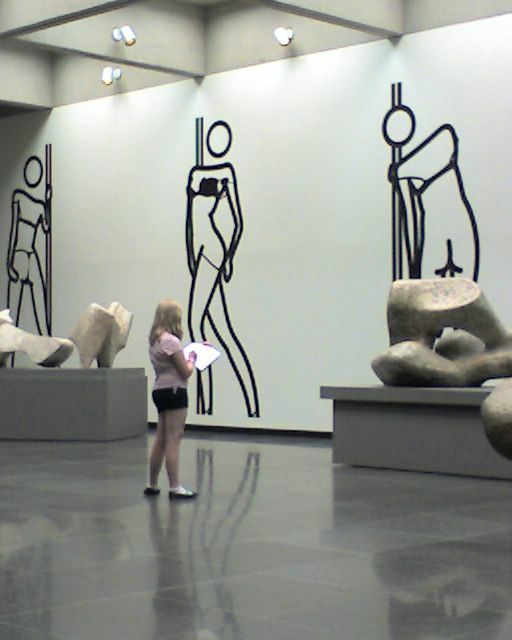 Who knows what they are drawing. I'm not trying to make any judgments here. Art is there to provoke and stimulate. It just seems an odd juxtaposition. In a way the whole scene is a piece of art itself,-- maybe something a Diane Arbus would make better sense of rather than me.